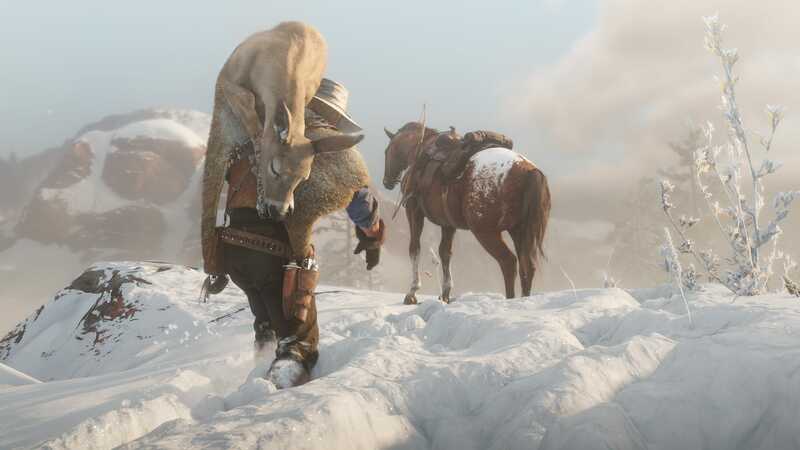 Red Dead Redemption 2 will be packed with around 200 species of animals, so it’s no surprise that hunting, a key aspect of survival and monetary profit, is just as detailed. After hunting, you can skin and butcher the animal immediately or take it with you back to your camp to feed your crew or craft clothing and other items. If you have all your needs met, you can even sell it to a local butcher or general store. Hunting larger animals in Red Dead Redemption 2 will require patience and steady tracking. Like any hunter knows, not all kills are considered equal: your “choice of weapon and shot placement… will affect the quality of the meat and pelt, which in turn affects the price that traders will pay for them.” According to Rockstar Games, “a bow and arrow is often the optimal weapon of choice for clean kills.” Similarly, your success with fishing is entirely dependent on selecting the right bait or lure. As far as animals, your primary interaction will be with your horse which serves as your constant companion. Red Dead Redemption 2 will have 19 different horse breeds, each with their own handling and characteristics. How can you get them? Well, you can buy them, steal them, or even catch wild ones. Your horse is a big part of your adventure, and how you take care of it will determine how well it takes care of you. Treat this creature well and your horse, and bond, will become stronger. And “with 59 different styles of coat, and a huge range of customizable tack, including saddles, horns, stirrups, and spurs” that you can purchase from a stable, you’ll have plenty of ways to keep things fresh. These items can improve your horse’s performance or simply be an aesthetic choice. You can venture into the wild when Red Dead Redemption 2 releases October 26, 2018 on the PlayStation 4 and Xbox One.